The economies of the Middle East, with their low growth and high unemployment, are one part of what is making the politics of the region so volatile. The March 2013 issue of Finance & Development, from the IMF, has a group of articles on various aspects of the economic challenges for the Middle East. Here are some of the main points as I see them. 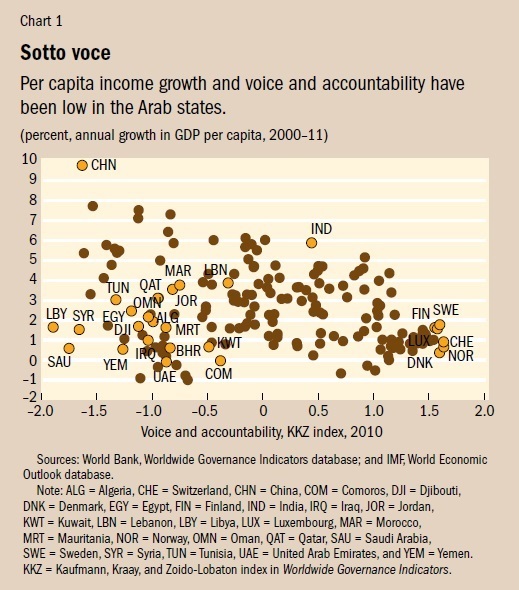 As a starting point, growth in the region has been relatively slow, with high unemployment--all in a political context with relatively little outlet for people to determine the course of their governments.On this figure, the vertical axis measures annual per capita income growth from 2000-2011, while the horizontal axis is a measure of political "Voice and accountability." 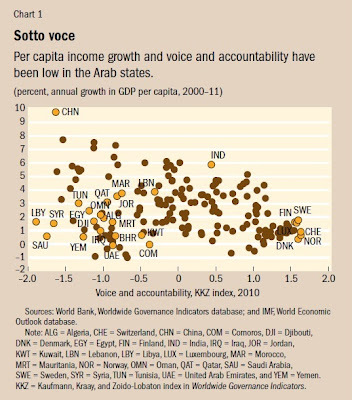 The countries of the Middle East are mostly grouped in that bottom left area: low growth and low voice. 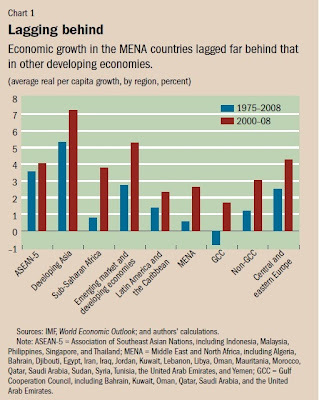 Here's a figure showing how growth rates in the economies of the Middle East and North Africa region have lagged behind other regions over 1975-2008 period (blue bars)--although the comparison does look a little better for this region if one looks just at the 2000-2008 period (brown bars). 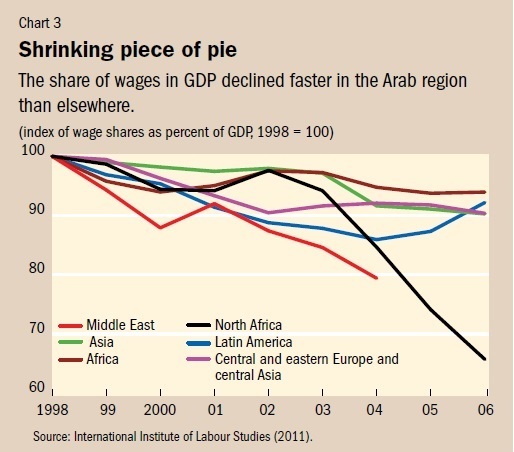 One of the striking fact patterns is that while the share of wages in GDP has dipped in many countries in the last 10-15 years, including in the United States, it was dropping harder and faster in the Middle East and North Africa than elsewhere. 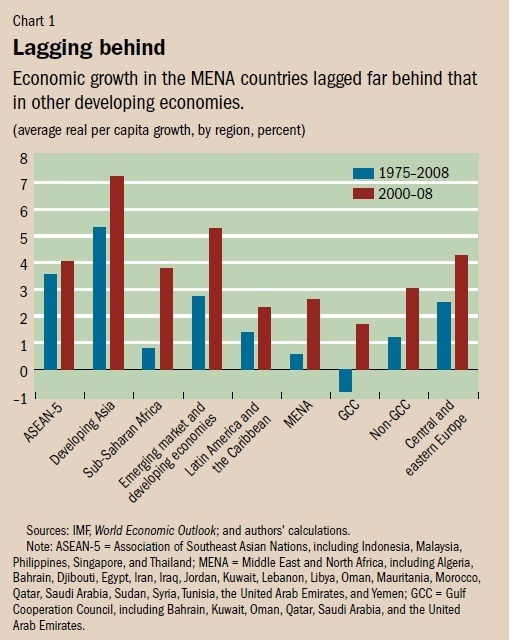 What policies can the countries of the Middle East and North Africa region undertake to spur growth? Many of the same suggestions come up in several of the Finance & Development articles. 1) Improve the environment for private-sector growth-- or at least don't strangle private-sector firms. world’s tiny middle class has relied on state salaries and entitlements, with few ties to free markets. The growth of local entrepreneurship on the back of burgeoning capitalism—and integration with the world economy—could help change that. " Here's a figure based on surveys of companies in the region as to what the biggest problems are that they face when they think about investment. 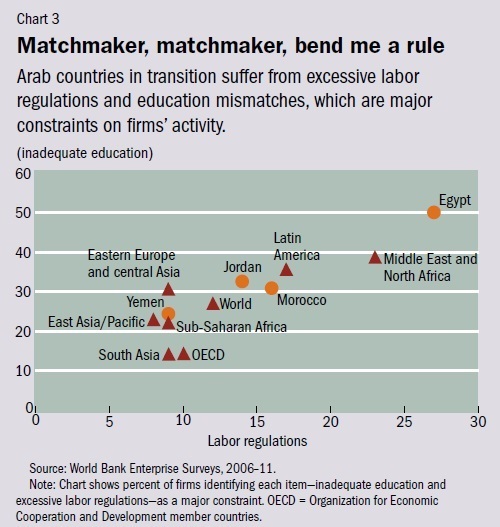 More detailed measures of corruption and regulatory burdens suggest that these are getting worse, rather than better. 2) Expand (non-oil) trade, both with the rest of the world and, perhaps just as important, with countries in the region. David Lipton writes: "The Middle East and North Africa is a diverse region, encompassing 20 countries with a population of more than 400 million people and $3 trillion in GDP—about 6 percent of the global population and 4 percent of global GDP. Country circumstances vary widely. Some countries in the region possess vast oil and gas reserves, while others must import both energy and food. The most telling economic statistic about the region, however, is that non-oil exports of the region, the whole region, are $365 billion, about the same as the exports of Belgium, a country of 11, not 400, million people. This region suffers from a lack of integration into the world economy. 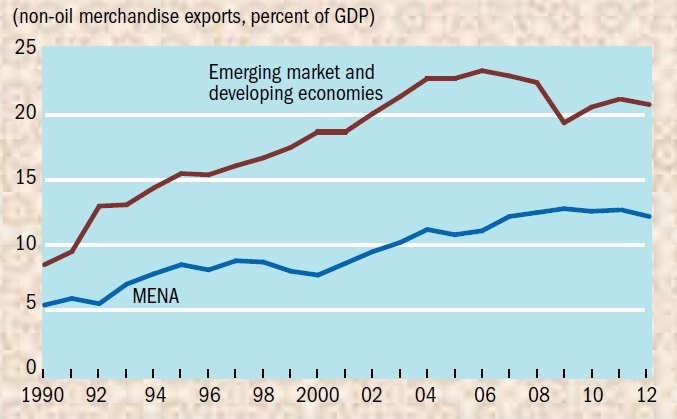 Here's a figure showing non-oil merchandise exports as share of GDP. 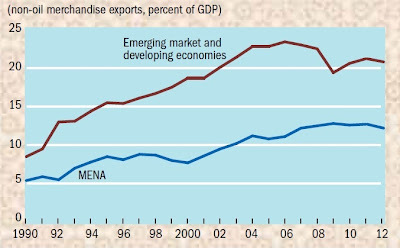 The Middle East and North Africa region has seen some gains in recent decades, but in an age of globalization, it isn't keeping up with the rest of the emerging and developing countries of the world. 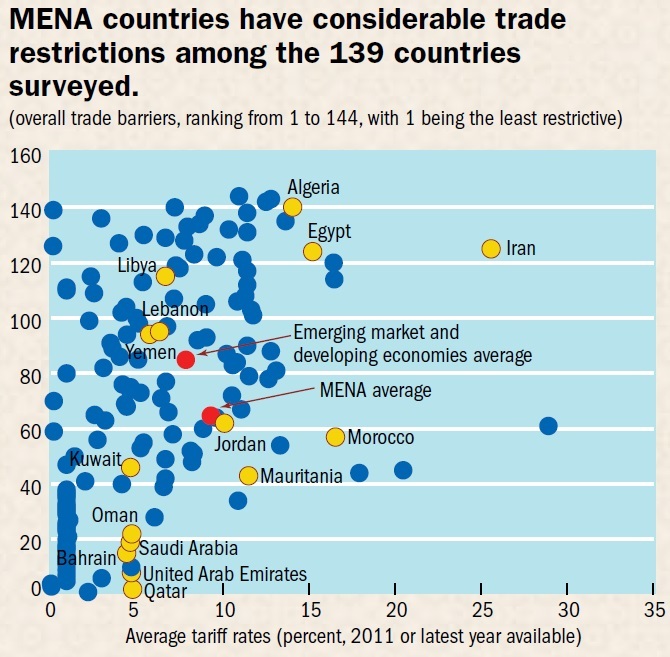 This isn't so much a matter of explicit tariffs, which aren't that much higher for the region than for other emerging and developing economies, but other non-tariff trade restrictions. What's particularly striking is the low level of interregional trade. There may be political constraints against opening up trade with other regions of the world, but the countries of the Middle East do very little trade with each other, either. 3) Reform the financial sector, especially the banks, so that banks do less lending to government and more lending to private sector firms. Adofo Barajas writes: "Using standard measures of depth in banking (ratio of private sector credit to GDP) and stock markets (market turnover or ratio of value traded to GDP), it appears that financial development is quite adequate in the MENA region, amply surpassing the averages in other emerging market and developing economies. 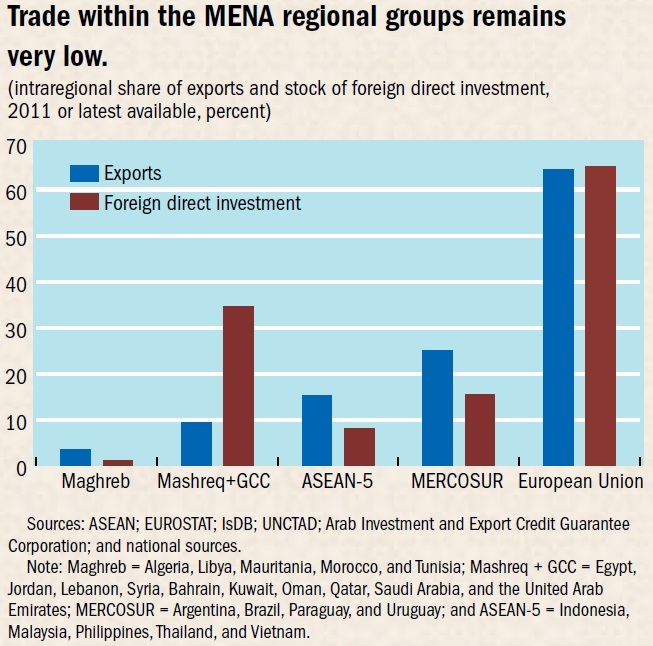 ... [W]hile the capacity of MENA economies to generate deposits has been quite substantial, the intermediation of those funds by banks into private sector credit has not been as impressive. MENA banking systems are more likely to send funds abroad or invest in domestic securities—government bonds, for example—than increase credit one-for-one with additional deposits received. ... 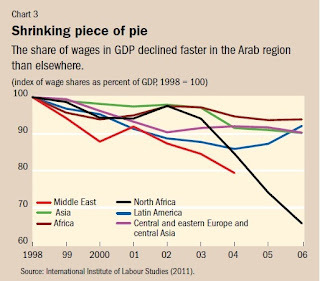 This is partly due to heavy public sector borrowing, particularly in certain non-GCC countries. For example, in Algeria, banks lend almost 50 percent more to the government than to the private sector, in Syria over 20 percent more, and in Egypt roughly the same amount as to the private sector. 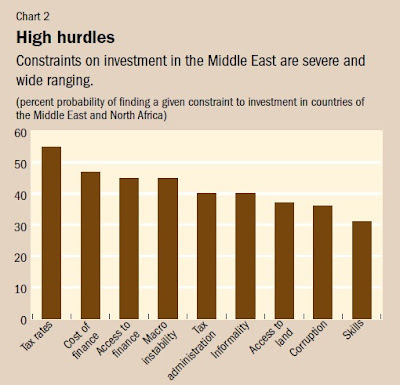 On average, MENA banking systems lend close to 13 percent of GDP to the government and to state-owned enterprises." 4) Stop subsidizing prices, and instead focus on helping those with low incomes. protection: only about 20 to 35 percent of spending on subsidies reaches the lowest 40 percent of the income distribution. By contrast, in well-designed means-tested cash transfer systems, typically 50 to 75 percent of spending reaches the bottom 40 percent." I don't want to be a pure economic determinist. There are any number of political, ideological, cultural and raw power play clashes happening across the Middle East that don't have a lot to do with whether per capita economic growth is 1% higher or lower. But living in a country with better prospects for jobs and careers and growth does help to take the edge off social turmoil. For more discussion, here's a post from August 2011 on "High Food Prices and Political Unrest" in the Middle East, and here's a post from January 2012 with more wide-ranging discussion of the "Economic Underpinnings of Arab Spring."